We provide extensive photographic and/or videographic services to discerning clients who want quality at affordable prices. Whether in our portrait studio or on location for weddings and other events, we guarantee your satisfaction. So if you are in Idaho Falls or eastern Idaho, give us a call today. We also provide services to customers in Utah and the Jackson Hole area. We want to become your photographer. We provide quality portraiture at affordable prices. You can come to our portrait studio, or we can come to you. Whether you want wedding photos, senior pictures or family portraits, we are prepared to meet your needs and guarantee your satisfaction. Call or visit our portrait studio today! Our portrait photography is performed with digital Nikon cameras. In a typical portrait session, photos are taken with two or more backgrounds and then reviewed on a large screen monitor. Generally, twenty to one hundred images are captured. Customers then examine the photographs and choose the portraits they wish printed. Photo-editing can also be requested, such as blackening backgrounds or vignetting. Touching up blemishes, rashes, etc. is also possible. 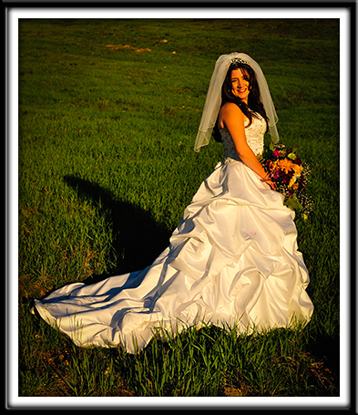 We can provide beautiful memories of that special day with top-quality wedding portraits. From the bridals to the reception, we're prepared to produce great portraits. We work with clients to tailor specific packages of wedding services so that we accommodate both your needs and your budget. We can film your event, compile and edit the video, and make final DVD's for you to enjoy for years to come. We can even film your wedding in high definition. Some customers request that we simply record raw video files that they later edit and turn into personal video projects. Alternatively, we can record and edit video and render completed DVD videos. We provide quality product photographic services. So if you're a business and need photos of equipment or merchandise for brochures, websites or other media, we guarantee your satisfaction. Additionally, we often attend local youth sporting events and provide photographer services. Customers may peruse results of those photo-shoots online and purchase prints directly from our Photoreflect site, or just click on "Find My Pictures" on our main web page. Click here for information on prices. We want to be your new photographer.